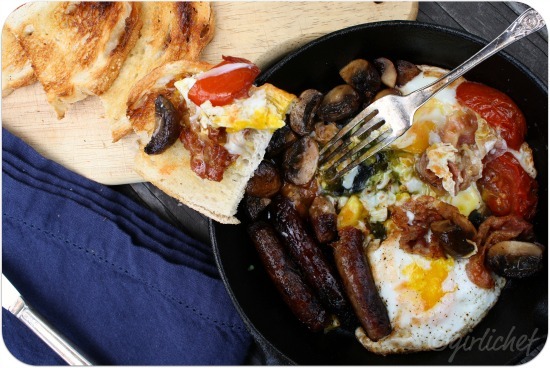 While I'm posting this awesome skillet full of breakfast-anytime food in honor of Mexi's birthday (today) and Father's Day (in 3 days), I'd be lying if I said I didn't enjoy this just as much as the guys do. People often look on this as man-food or a manly breakfast...in my house we don't discriminate. The "midnight" in the title comes from the need to fill your stomach after being out at the bars or pubs or clubs. Back in college when I lived in the dorms and we had no way of cooking anything for ourselves, we always stopped for fast food...usually a Whopper or a Chicken Sandwich from BK. All that grease surely helped to soak up some of the alcohol. This meal is about a million times better in taste, smell, and presentation- and it will do the same job. Sometimes we spend the summer days and summer nights outside, gradually lighting the fire and hanging out with some beers until all hours. If we don't wind up roasting something on sticks while we're out there, we come in famished around eleven or twelve, and this will fix us right up. But like I said, nobody has any qualms about frying this up in the daylight, either. Turn your broiler on. Place a large, nonstick (I use cast-iron) pan over high heat. Throw in your breakfast sausage (2 or 3 per person), halved if you wish for faster cooking. Once the sausages are about cooked through, throw in about a hanful mushrooms per person (halved or quartered if very large). The shrooms will soak up the sausage grease, but if it seems not to be enough, then drizzle with a big of olive oil. Sprinkle with a bit of salt and pepper. Throw a couple of tomato wedges (per person...or use some nice cherry tomatoes) in the pan. Add a couple of slices of Pancetta (or bacon) per person. Once the Pancetta has begun to crisp up, crack in the eggs in empty spots, sprinkle with a bit of salt and pepper and allow to cook for another minute or two. Slide the whole pan under the broiler to finish cooking the eggs. Serve with some good toast and some hot sauce. wow, this looks super. I've not been active on blog hopping because my peanutbutter♥ is on vacay from his work overseas. Your blog looks so good!!! I love the new look! I saw Jamie make that on the Food Network and it looked amazing so I bookmarked and never got to it, yours looks absolutely fantastic and I will be making it for sure now! To me this is the ultimate breakfast!!!!! 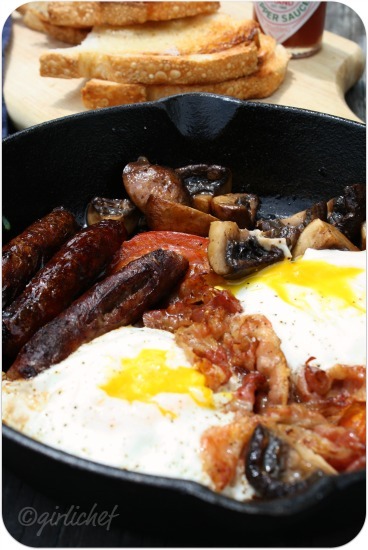 What a great "fry-up" as my Brit friend would say. Perfect hangover food! @John...I completely respect people's choices to not eat eggs...but I'd expect them to respect my choice to enjoy them, just the same. DEFINITELY anytime! Love those tastes running together. Vaya desayuno rico que te ha quedado. Yum, my hubby would love that. I'll have to make a little room for some hashbrowns too. Man food schman food. I think this would appeal to anyone with a pulse! 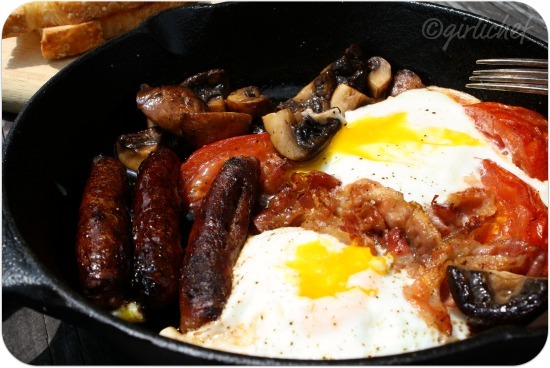 Yeap, potential hangover pre-cure in a skillet! 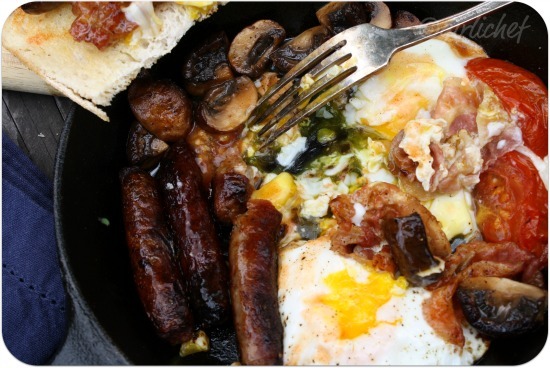 Omg, irresistible breakfast, would love to have for sunday brunch..
What's not to enjoy! Looks like the perfect breakfast! This would make any dad or man very happy...morning or night. Thanks for sharing your creative self with me tonight! I hope you have a beautiful day tomorrow. Your meal is fit for a King & Queen!!! Thank you so much for sharing, Heather. It's 9:30 PM and I'm hungry!!! that is EXACTLY the breakfast i aim for on weekends. yum! when i first moved to england, i lived in a long term stay hotel. every morning they would serve a full english breakfast and every day i would eat it! your recipe brings back some great, if not full memories! Oh jeez I love breakfast so much. Skillets are a normal meal in our house, but I like to include spinanch, or beans or left over carne asada!!! FAV!!! Looks delicious (morning, noon OR midnight). I just want to dive right in. Well I have to say that your post does bring back some memories of the midnight breakfast, oh yes. I am with you around here I love it just as much as the guys and your skillet looks awesome. Thank you so much for sharing with Full Plate Thursday and hope to see you next week! Oh this brought smiles to my face. I had many such skillet breakfasts at midnight. Usually during tech week for a show - when you rehearsed until midnight! But I agree - it's just as tasty during the day! Oh yeah! I totally want that after a night of imbibing.. or any old time really. In fact now would be perfect. In Toronto, you see the sausage carts stationed outside some bars late at night, for much the same reason! I love a cooked breakfast in the morning after a big night out. It's guaranteed to make you feel better! This skillet is the perfect meal, one that is best eaten directly over the skillet while standing up because you can't be bothered to sit down. Delicious. I love brinner,it makes my night to have breakfast for dinner!And your brinner looks delicious,divine. This looks perfect for any time of the day or night. It's making me drool.